How was your Monday? Because for thousands of Beşiktaş fans it was a dream come true. 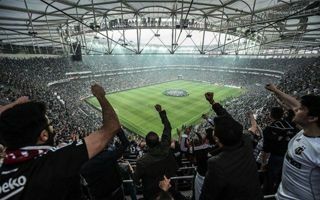 After 1,065 days under construction, Vodafone Arena opened its doors last night in an exciting event. Already hours before the opening game streets were jammed and supporters lit vast amounts of pyrotechnics outside the ground, covering the entire Beşiktaş district with smoke. Not electric enough yet? Of course the game was sold out, which seems obvious after nearly three seasons of exile, but yesterday there was something more to it. First, Bursaspor were the rivals and you won’t find a team that boils the “Black Eagles” fans’ blood more, of course not counting derby rivalries. Then on top of that Beşiktaş were top of the league, pursuing their 19th championship. And, since we don’t cover on-field action, here’s a spoiler: they won 3:2, keeping Fenerbahçe 6 points behind. Among the reasons for extremely long and turbulent process was the unique location of the stadium: beautiful, but extremely constrained. The site of former Inönü Stadi is the heart of Istanbul, but at the same time it’s also under landscape protection as direct vicinity of the Dolmabahçe Palace. That’s why the new stadium couldn’t be too tall (41.5m at peak, from southern ground level), while digging deeper was impossible due to waters of the Bosporus. As if this wasn’t enough, already the old stadium was tightly surrounded with roads. Despite Beşiktaş being among Turkey’s most popular clubs, there was only enough room for app. 40,000 seats. Greater numbers would be impossible to fit, not mentioning the traffic deadlock every matchday would have caused. DB Architects faced a major challenge, but they passed the test with flying colours. To fit the desired seating bowl, it was divided into two tiers. Lower one is fairly flat (23.4°), while the upper ring is very steep (38.7°). Number of rows varies, peaking in the north and slightly lowering towards the south. Just like in the old stadium, where semi-open south end allowed to admire the Bosporus and Asian part of Istanbul. With limited space, percentage of corporate seats is fairly high. Roughly 1 out of 10 seats is a premium-level one. There are almost 1,900 seats in 147 skyboxes spread across three stands (only the north has none, offering room for a larger terrace for singing fans). The robust stands are surrounded with simple and elegant colonnade, somewhat resembling a coliseum. Covered with limestone, the façade blends very well with historic surroundings. Especially that the southern Marathon Gate of the old stadium was fully retained. Just like the old stadium, the new one has clear form, is symmetric and elliptic. The latter term doesn’t mean there was room for a running track, quite the opposite. Fans are as close to the action as possible, 6.15m along the sides and 7.95m at both ends.